I am a big fan of statcounter and you can see statcounter celebration post that I have posted sharing the excitement of statcounter award from BusinessWeek. In the week to come, I will spend time to write up how I use statcounter free traffic reporting to help me understand my audience. 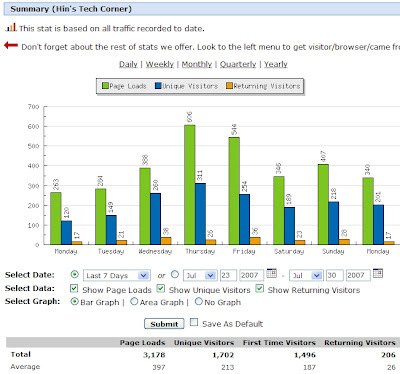 Page Loads -- it refers essentially as pageviews that I understand with the data mining work that I have worked on. Unique Visitors -- unique visitors to my blog or site. Wow, looks like you are getting a fair amount of page hits a day. Keep it up, you must be doing something right.